Birth: 1986, Kotor, Montenegro. His family roots are in Scotland. By winning at the music competition “Intro Karaoke” in 2003, he earned the right to participate at the music festival Suncane Skale in Herceg Novi where he finished at the high second place with the song “Posljednja Obala”. The same year he received music award “Montefon” as the “Breakthrough of the year”. He already participated two times at the national competition for the Eurosong. First time in 2005, when he finished at the high fourth place with the song “Utjeha”, and the second time in 2006, when his song “Cipele” was awarded with Grand Prix. At the competition Eurosong 2007, he will defend the colors of Montenegro with the song “Ajde kroči”, composed by Slaven Knezovic and written by Milan Peric (author team, which participated at Eurosong in Kiev in 2005). Education: He became a professor of the violin at the age of nineteen, and has received many international and domestic awards at numerous competitions. He is especially proud of his participation in the World Orchestra of Young Musicians. In 1989 he won the annual prize at the city level, ‘19 Decembar’ as the best and the youngest student of the Montenegrin University ‘Vejko Vlahovic’. Experience: He is a successful composer, having written all kinds of songs, for children and adults. He is the author of the song “Hymn of life”, a song aimed at reducing drug addiction. He is a member of the Association of Entertainers of Montenegro and the Association of Composers of Montenegro. This is Mr Knezovic’s second participation at the Eurovision Song Contest. Together with Mr Peric, a songwriter, he participated at the Eurovision Song Contest in Kiev in 2005, where their song came 7th in the finals and received a special award, the Composer Award for special cultural contribution to music both in the music style and lyrics. Plans: He wants to open the best music studio in the Balkans. Birth: He was born on 3 March 1947 in Podgorica, a father of five children. He has been in the music business for more than 35 years. He has participated at almost all festivals in Montenegro and ex-Yugoslavia, co-operating with many famous composers and music arrangers and receiving numerous rewards. He is very successful in all musical fields, from songs for children to pop, rock and ethno music style. 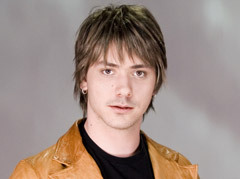 4) in 2007, he will represent Montenegro with the song “Come On, Step Up” in Helsinki. Birth: Born in Podgorica on 19 July 1985. Education: He started studying music at the age of seven when he entered primary music school “Vasa Pavic” in Podgorica. While at primary music school, he played the guitar and the piano. In 2005 he finished secondary music school, the department of theory of music and the instrumental department – he played the double bass. Experience: In 2003, he founded the group No Name, which represented Serbia and Montenegro at the Eurovision Song Competition in Kiev 2005. This group came seventh in the final with the song Forever Mine, while the authors of their song received a Composer Award for special cultural contribution to music both in the music style and lyrics. Mr Peric was the group’s frontman and bass guitarist. Apart from the considerable success in Kiev, Mr Peric received numerous awards at various competitions both as an instrumentalist and a member of the group. In 2006, Mr Peric decided to change the music style and to form a new group which would play rock music. The forming of the group is ongoing. Birth: 3.7.1988. Place of birth: Kotor, Crna Gora. Experience: He comes from a musical family. His sisters played piano in a Lower Musical School, and one of them graduated at Musical Academy. Father is in music business for 40 years, and he played drums in some leading Montenegrin bands including ”Biseri Boke”, ”Teodosi” i ”Egzodus”. He also performed with some of the leading musicians from former Yugoslavia like: Lidija Kodric – Ljubljana, Zdenka Kovacicek, Tereza Kesovija – Zagreb, Neda Ukraden – Sarajevo, Boba Stefanovic, Maja Odzaklijevska, Dejan Petkovic – Belgrade and others. He also performed with instrumentalists including: Stjepan Gut – trumbet, Branimir Djokic – accordion, etc.He made his first musical steps with his father and his band. He got his first proffesional drumm for his 14-th birthday and started to train activelly. Ocassionaly, he played instead of his father in a band ”Egzodus” from Herceg Novi. He and his friends formed a first band named “Secret” in 2003. Then, he received an from the band “Geronimo” from Tivat, and they successfully performed all over Montenegro. Besides “Geronimo” he performs with many other Montenegrin rock bands and with the orchestra “City Music Kotor” in Montenegro and abroad (Bosnia, Croatia…). Now he is a member of Stevan Faddy’s team as a drummer. Education: She is a senior undergraduate student at the Faculty of Literature and besides singing in her free time she studies astrology and paints. Experience: She made her first musical steps by playing violin. As a teenager she developed a true love for singing. During that period she competed at three national festivals and each time received an award for interpretation. As a member of the band “Europe” she participated at the national competition fro the Eurosong in Belgrade in 2003. She is often hired as back vocal in studios and as a vocal for demos. Education: Musical High School, V. Pavic, Podgorica and K. Stankovic, Belgrade; solo singing; Musical Academy in Podgorica and Pristina; graduated harmonic analysis with the average grade 10. Working experience: Employed in education system since 1991. As a professor she worked in lower, primary and high musical schools. She initiated a great number of permanent and generational groups and choirs, for school and other purposes. After graduation she started to work as a songwriter, composer and pop-music performer. She had numerous solo performances and participated at major spectacles. As author and performer she also participated at the most important musical festivals in the country. She successfully participated at three Montenegrin national competitions for the Eurosong festival. She is author of numerous hit songs for children and pop-music. She was back vocal for many singers and bands, which contributed to the quality of the music. She is known for her ability to successfully combine different music genres and to spot a talent. As a result of that each year Montenegrin musical scene thanks to her gains full-grown musicians of all age. In the world of music she is known as a professional, reliable co-worker who is always on time and who generously shares her knowledge, experience and ideas in order to accomplish main goal – complete and god composition. i don’t understand why he wasn’t in FINAL ! I’m a rapper but I like his song ! a very good song !